Copplestone Castings released some new Barbarica Cavalry Command Packs over in their webshop. Keeping barbarian cavalry in line... that's gotta be a rough job. 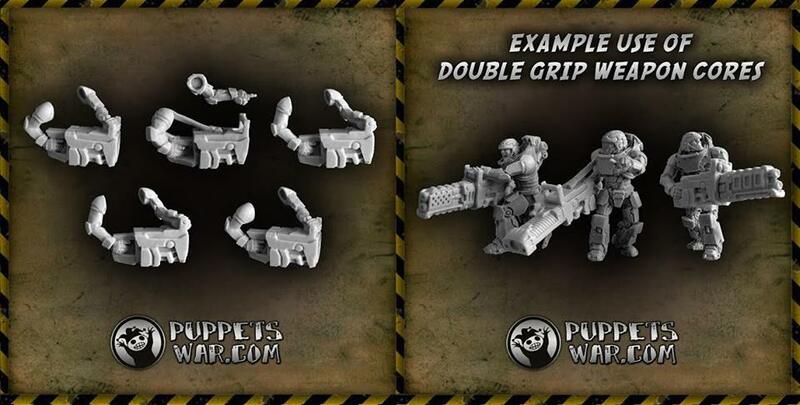 The production moulds for these 2 new sets were made much more quickly than I expected so they are now in stock. FM22 Northlander Cavalry Command - 2 leaders, 2 standard-bearers and 2 hornblowers - all bearded and Northern. FM23 Barbarian Cavalry Command - 2 leaders, 2 standard-bearers and 2 hornblowers - all clean-shaven in the traditional `Cimmerian` style. With this range I`m using 1/100th as a base scale - so a hulking 6 foot tall barbarian is 18mm tall (to the top of his head). Lesser humans, like the Romans, will be correspondingly smaller. 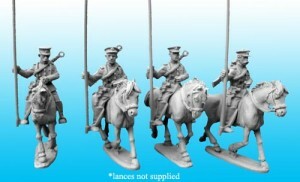 Copplestone Castings released a pair of new 15mm cavalry units over in their webshop. FM20 Northlander Cavalry - 6 different hairy tribesmen with a couple of horse poses. FM21 Barbarian Cavalry - 6 clean-shaven warriors in more of a Conan style. Command packs for these tribes are just about to go in production and will be available by the middle of next week. By the way, our Barbarica range is now available in blisters at most UK shows from the Wargames Emporium stand - as well as our other ranges. 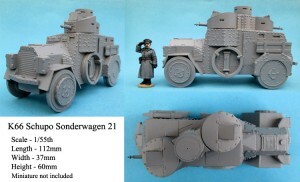 Copplestone Castings released their new Schupo Sonderwagen over in their webshop. K66 Schupo Sonderwagen 21 - after WW1 the German army was forbidden from having any armoured vehicles, but a loophole allowed the police force to use them. One of these police vehicles was this monster of an armoured car. Some of them were still in use in WW2. Copplestone Castings is having themselves a sale this weekend. Go get yourself some minis for cheaper than you'd usually have to spend. This weekend we have our traditional 10%-off sale - from midday on Friday 8th November until midday on Monday 11th (UK times). All you have to do to get 10% of anything you order is enter the promotion code - xmas - when prompted at online checkout. 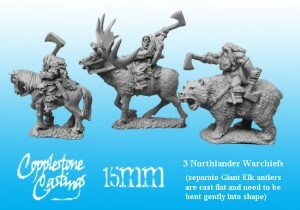 Copplestone Castings has some new 15mm Northlander Warchiefs models available over in their webshop. Copplestone Castings has two new hill giants, Gog and Magog, for their 15mm fantasy line available over in their webshop. Copplestone Castings will be having a sale this weekend over on their website. This weekend from midnight on Friday 19th April until 9am on Monday 22nd April (UK times) you can get 10% off anything you order online. All you have to do is enter the promotion code - mojo - when prompted at checkout. Copplestone Castings has started up their Christmas sale over on their website. From midnight on Friday 30th November until 9am on Monday 3rd December (UK times) you can get 10% off anything you order online just by entering the promotion code - xmas - when prompted at checkout. Copplestone Castings has some new mounted White Russian Lancers available over in their webstore. An unexpected addition to the Back of Beyond range: some elite White Russian Lancers serving in a Chinese arlord army. These well-equipped cavalrymen are based on a unit in ChangTsung-chang`s army who wore dark green, almost black, uniforms with yellow boots. Copplestone Castings has 3 new dwarf units available in their webstore: axemen, spearmen and commanders. In my alternative Roman Britain the dwarves live in the Scottish Highlands (which are a lot more mountainous than in our reality). They are usually allied with the Northlanders in their battles against the Romans, but will never fight alongside Snowtrolls. 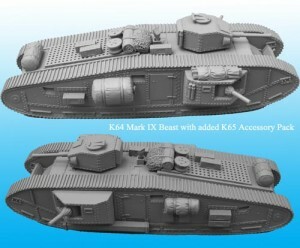 Copplestone Castings has released their new k64 Mark IX Beast tank over on their website. It's a big 'un. K64 Mark IX Beast - a super-heavy Interwar-style tank. This resin kit is a massive 187mm long, 73mm wide and 58mm high. The figure in the picture (sold separately) shows what a monster the Mark IX Beast is. K65 Mark IX Beast Accessory Set - all the bits you need to add more character to your straight-from-the-factory tank: 2 alternative sponson gun barrels, 5 pieces of baggage, 2 cable drums, 2 petrol cans, 6 ammo boxes, 1 long unditching beam and a short unditching beam with 2 support brackets. Copplestone Castings has some Zanzibar regulars now available on their website. The small regular army of the Sultan of Zanzibar wore white uniforms with red fezzes. If you don`t want to use them as Zanzibaris they make good all purpose askaris for a Darkest Africa campaign. Copplestone Castings has several new releases up on their website for you to check out. Copplestone Castings has some new terrain up on their website they want to show off, and that's what we're here for (to spread the news to you fine readers), so here they are. FMT4 Hidden Lairs - 3 different rocky outcrops concealing narrow entrances to underground Pictish lairs. FMT5 Eldritch Statue - an aeons-old statue of one of the elder gods, unmarked by time, a focus for dark magic. Copplestone Castings is having a sale this weekend. Those are always good things. This weekend from midnight on Friday 20th until 9am on Monday 23rd you can get 10% off anything you buy online just by entering the promotion code - barbarica - when prompted at online checkout. Copplestone Castings has a new set of barbarian models up on their website for you to peruse. Missile support for your barbarian hordes - all clean-shaven because in my fantasy version of Roman Britain the bearded Northlanders disdain such cowardly weapons. Not historical Picts, but powerful, squat Neanderthals with stone weapons and poison arrows brooding in their underground lairs, working their dark magic, preparing for the day when they will reclaim their lost lands. Next packs for the Picts will include a chararacter pack (wizards, witches and champions), cave trolls and Cthulhoid demons. 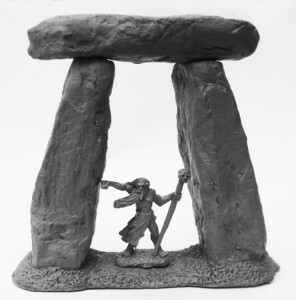 Nick Lund and I have been working on some rules for the range and we wanted to make terrain items more than table decorations so stone circles and standing stones are magical-power enhancers and the trilithon is a ley-line gateway. Future terrain pieces will include Roman roads (magic nullifiers), barrow tombs, Pictish statues of the Elder Gods and Pictish lairs. This weekend from midnight on Friday 25th November to 9am on 27th November (UK times) you can get 10% off anything we sell just by entering the promotion code - xmasoffer - when prompted at the online checkout. Copplestone Castings has released new 15mm Barbarians to their online store. FM4 Northlander Characters - 10 chieftains, champions and sorcerors. FM5 Snow Trolls - 3 primitive trolls from the Far North armed with stone weapons. FM6 Barbarian Warriors - 12 assorted miniatures with swords and axes for anyone who prefers their barbarians beardless. Copplestone Castings is having an October special. Both are packs of 12 assorted warriors randomly picked from a range of variants. The next packs (available in a couple of weeks) will be Northlander Characters (muscle-bound warchiefs and champions with a quartet of witches) and Snow Trolls. The Medium C was intended to be the battle-winning tank of the great 1919 offensive - thousands were ordered but the end of the war in November 1918 meant that few were actually built. Great what-if or Pulp-adventure vehicles. From midnight on Friday 15th April until midnight Sunday 17th April (UK times) you can get 10% off anything you order just by entering the promotion code - spring - when prompted at our online checkout. Our ranges at Salute Although we`re not going to the Salute ourselves the Gripping Beast/ North Star megastand (TH05) will have a good stock of most of our ranges in clampacks - everything but The Glory of the Sun, 1/55th Armoured Vehicle or 10mm Fantasy ranges.